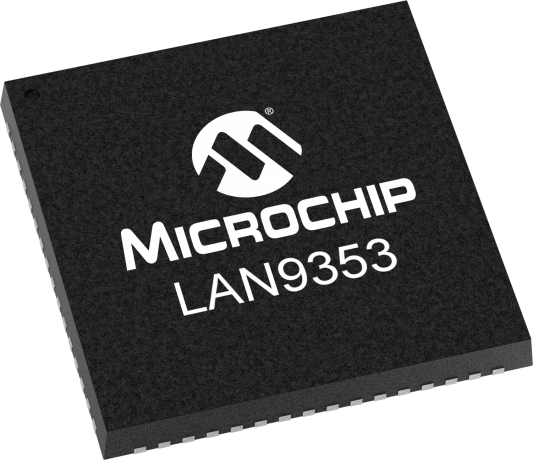 Microchip's LAN9353/LAN9353i is a high-performance, small-footprint, full-featured 3-port managed Ethernet switch. This device is application-optimized for consumer, embedded and Industrial electronic designs which require a highly integrated, cost effective device with switching functionality, flexibility and ease of integration. The LAN9353/9353i supports compact PCB design and MII/RMII/Turbo MII (Media Independent, Reduced Media Independent and Turbo Media Independent Interfaces). This device supports Turbo MII mode to accomplish network speeds up to 200 Mbps. The LAN9353 can also be configured to support Dual RMII operation. The virtual PHY feature mimics a single PHY connection through the MII/RMII/Turbo MII interface to the host SoC, which reduces software development time. This feature also allows system designers to swap the single PHY and Ethernet switch to create multiple SKUs from the same software driver. Ethernet applications. 100BASE-FX is supported via an external fiber transceiver. This device complies with IEEE 802.3 10BASE-T and 100BASE-TX Ethernet protocol specifications, enabling compatibility with industry standard Ethernet and Fast Ethernet applications.